It was Bangalore all over again, this time in Guayana, today West Indies beat Bangladesh by three runs in the second one-day international to level the three-match series at 1-1. The victory has helped hosts West Indies to level the series at Guyana on Wednesday ahead of Saturday’s final at Warner Park, Basseterre. Hetmyer’s second ODI hundred helped Windies recover from a top-order shortfall and post 271. He showed immense composure in piling on a 103-run fifth-wicket stand with Rovman Powell after Evin Lewis, Chris Gayle and Shai Hope failed to give Windies a good start. 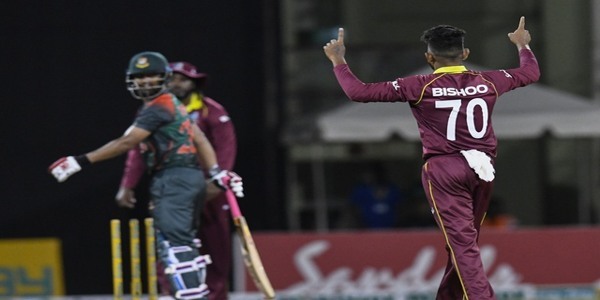 It looked like Bangladesh were on course for a victory and a second series win against the West Indies on their home turf when Mushfiqur Rahim and Mahmudullah Riyad steadied a rocking boat and guided them close to their target of 272, with seven wickets in hand and 40 needed off the last five overs. But the Tigers had shown in the past that they are the masters of fashioning incredible defeats from positions of absolute strength, and that was again played out before a sparse crowd at the Providence today, starting with Mahmudullah’s mind-boggling run-out (39). Mushfiqur, though, played sensibly with Sabbir Rahman and it looked like he was out to banish those past memories of failure as Bangladesh inched to within eight runs of victory with seven balls remaining. A mistimed flick from Sabbir (12) in the final delivery of the penultimate overlooked like a minor hiccup before Mushfiqur’s mistimed pull off the first delivery of West Indies skipper Jason Holder found the man in the deep. The former captain had scored 68 off just 67 deliveries. The other batsmen, though, hardly had the guts or the skill to eke out the eight remaining runs off the last five deliveries. The end of the innings was a far cry from the start as Bangladesh smashed 71 off the first seven overs, with Anamul Haque striking 23 off nine before Tamim Iqbal and Shakib Al Hasan feasted on some wayward bowling from the West Indian pacers. The explosive start gave way to a slow static and nervy progress in the middle overs as two spinners — Ashley Nurse and Devendra Bishoo — spun their web around the batting, utilising the increasing turn and bounce off the pitch and eventually forcing two injudicious strokes from Tamim (54) and Shakib (56) in quick succession. But Mushfiqur and Mahmudullah took their time, calmed their nerves, and with a bit of luck, weathered the storm and saw off the two spinners as Bangladesh looked certain to chase down the target, only to throw it away yet again at the end. Credit went to Hetmyer’s superb 93-ball 125 that pulled West Indies out of a rut. His 103-run fifth wicket stand with Rovman Powell, who contributed a 67-ball 44, was instrumental in their turnaround. Hetmyer, only 21 years of age, had to take the attack to Bangladesh in the last 10 overs almost single-handedly, hitting six of his seven sixes during that period. Hetmyer brought up his hundred in the 48th over, becoming the youngest Windies batsman to score an ODI hundred in the Caribbean. Hetmyer followed up his excellent half-century from the first match with a 93-ball 125 — the second ODI hundred for the 21-year-old left-hander — to salvage nose-diving innings and take it to a fighting total as the hosts looked to avoid a second home ODI series defeat against the Tigers. When Bangladesh started, Anamul Haque gave them a blazing start with his two sixes and as many fours, but Alzarri Joseph halted him in the third over. Tamim Iqbal and Shakib Al Hasan maintained the momentum and gave Bangladesh to their fastest fifty in ODIs in 4.4 overs. The duo hit four more boundaries – through point, cover, and mid-off – as the visitors made 79 for 1 after ten overs. Then, the picture began to change dramatically, as, over the next 20 overs, Bangladesh scored only 67 runs. Tamim fell prey to Bishoo in the 25th over, with the opening batsman stumped a long way out of his crease. Shakib also got out to a poor shot, hitting a wide Nurse delivery down point’s throat, after having made 56 off 72 balls, with five fours. Tamim scored 54 off 85 balls. Mahmudullah and Mushfiqur kept their calm despite the required run-rate crossing seven per over after 35 overs, keeping them ticking and taking them closer. But after adding 87 runs in 15.5 overs, miscommunication gave West Indies a breakthrough and set up a nervous last five overs. Mahmudullah, who made 39 having survived a dropped catch on 17, was stranded a long way from the non-striker’s end after Mushfiqur was hit by a Holder short ball. He struck two sixes in his 51-ball stay, but it was an unusually slow innings. Mushfiqur hit fours with a scoop and a pull, apart from clipping Joseph for a six in the 44th over. But it all fell apart for Bangladesh in the last two overs. Earlier when West Indies batted, for the second match in a row, they were slowed down by a build-up of dot balls. Both openers Evin Lewis and Chris Gayle fell leg-before to Mashrafe Mortaza and Mehidy Hasan Miraz respectively. Shai Hope scored 25 off 43 balls, before giving Sabbir Rahman an easy catch at cover after Shakib Al Hasan outfoxed him with a delivery that stopped on Hope. 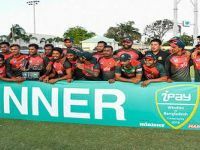 When Jason Mohammed got out the 24th over to Rubel Hossain, who again struck in his first over, the home side was staring at a sub-par total. Powell, though, chipped in with important runs, hitting 44 runs off 67 balls while playing second fiddle to Hetmyer, who stole the show 3 fours and 7 sixes en route to the highest individual ODI score by a Windies batsman at the venue. After Powell’s fall, the West Indies lower-order followed suit quickly. It was only Hetmyer’s three late sixes – twice off a 22-run Rubel over – that pushed West Indies to a good total. Shakib and Mustafizur Rahman took two wickets while there was one each for Mehidy Hasan Miraz and Mashrafe Mortaza. Rubel was Bangladesh’s most successful bowler with three wickets but he was also the most expensive, giving away 61 runs in nine overs — his last over costing 22 — reminiscent of the infamous penultimate over in the Nidahas Trophy final against India and reflecting the apparent lack of ideas of Bangladesh’s bowling unit when under pressure. The third and final ODI is scheduled to take place in St. Kitts and Nevis on July 28. 75 years of age can be national champion! How many tickets were sold in the World Cup?